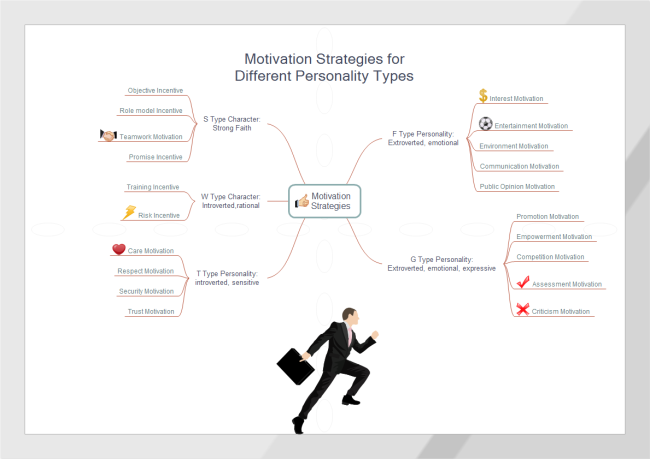 Mind map example about motivation strategies for different personality types. Free download and print. Increase leadership and personnel management through personality analysis. It is advisable to communicate, manage and motivate people with varied personality types. Motivation is to improve employees' enthusiasm and thus improve the corporation's performance by meeting employees' needs. With the rapid economic development, staff's personalities are playing an increasingly important role in their work. As a result, the establishment of personalized incentive schema based on different personalities is becoming more and more important. This article explores suitable motivation strategies for various type of workers from the perspective of personality. People of F type personality are extroverted and emotional. They are realistic and fun-loving. They regard their own interests more important than others. Managers should try to meet their needs for enjoyment and comfort when choosing incentive strategies. 1. Interest Motivation. F type employees are expressive, warm-hearted and interest-driven. They emphasize their own feelings, hope to become the focus and expect to gain real benefits. Managers can observe their behavior and offer corresponding benefits to motivate them. 2. Entertainment Motivation. F -type employees are emotionally intense and curious, but they also tend to lose interest easily. Once they feel bored, they will not take seriously their own work at hand. Therefore, managers should try to make the work fun, organizing a variety of entertainments, so that F type worker can keep enthusiasm. 3. Environment Motivation. This type of employees prefer rich and varied working environment. At the same time, they are creative and have a keen insight in art. Therefore, the managers should build original, cozy and artistic environment to boost their creativity. 4. Public Opinion Motivation. F type employees want to be the focus, but sometimes they overdo it and are easy to become a slave to public opinion, losing their own judgments. Managers should understand the weakness of such employees , and take advantage of public opinions to motivate them and improve their enthusiasm for work, and thus improve their performance. 4. Communication Motivation. Since this type of employees evaluate interpersonal relationship and mental satisfaction, managers should pay attention to their need and motivate them through communication. G type personality is characterized by extroversion, rationality and high self-expectation. It is advisable for managers to satisfy G type people's desire for opportunity and competition. 1. Promotion Motivation. G type staff highly value self-actualization and hope to gain a platform from the employer to perform and realize self-worth. A clear and detailed promotion system should be established to enhance employee's initiative. 2. Empowerment Motivation. Self-confident, decisive, goal-oriented and assertive are also features of G type personality. So they are qualified for leadership occupation. Managers can offer them more power and responsibilities so that they can give full play to their talent and skills. 3. Competition Motivation. For their courage to face competition and challenge and desire to realize self-worth through problem solving and rivalry, managers can properly improve beneficial competition and employees' competing awareness. 4. Assessment Motivation. Employees of G type personality are efficiency and success- oriented with resolution and courage to reach their goal. They tend to compare with others for improvement and desire acknowledgement of their effort through fair and reasonable evaluation system. 5. Criticism Motivation. They are maybe the most detached people among the team. The strong will may lead to neglecting of others' feelings. To deal with this group of people's weakness, managers had better criticize them appropriately when they make mistakes. Provocation works well for G type members, which can boost their will to fight. Being introverted and sensitive, T type people desire others' attention and acknowledgement. Managers should care and respect them better. 1. Care Motivation. The introversion and shyness are unbeneficial for socialization. Managers need to care introverted employees more. 2. Respect Motivation. Even though T type people are not good at expressing their feelings, they long for leaders' attention and acknowledgement, too. Leaders should pay attention to and respect them through daily work and communication. Their motivation can be improved by increasing self-awareness. 3. Security Motivation. As rigid and organized planners, they don't like changes and lack capability to manage emergencies and thus resist potential risks. To improve their security by developing effective security system is necessary for remaining low employee turn over. 4. Trust Motivation. T type people's advantage is acceptance of repetition. They desire trust from others very much. If managers trust employees, they will be more loyal to the organization. This type of employees are introverted but rational. They emphasize real return and development. Though they don't like to express their ideas, they clearly know what they need to do and what are beneficial to them. According to these traits, the following techniques are effective. 1. Training Incentive. W type people are knowledgeable, calm and good at analyzing and thinking, so they are often the best representatives of brainpower in the team. Compared with rights and power, they care more for whether their knowledge and skills can be improved. As a result, systematic training schema and funding should be created. 2. Risk Incentive. These employees are wise but not active. They will regard himself important in the case of crisis and will initiatively participate in teamwork. Improving their crisis awareness will be beneficial for tapping potential. S type character is a comprehensive type but they have strong faith demand. 1. Objective Incentive. Because S type people insist in their faith very much, if the administrators can let them have faith in work and companies, they will be devoted and persistent like no other. 2. Role model Incentive. They trust and love role models very much and desire to be like their role models. If the manager can set role models for employees and even become a role model himself, employees will be more hard-working and highly motivated. 3. Teamwork Motivation. Such kind of employees are concerned about cultural atmosphere of the enterprise and hoe that their own values and philosophy can be consistent with company's culture. Managers can organize suitable team according to their personality and improve team cohesion and performance. 4. Promise Incentive. Honesty is one good virtue of S type people and they want honesty from other in return. In terms of organization, its honesty to employees is also indispensable.